SCOPUS IS MANIFESTING DATA - DRIVEN DESIGN IN SPECULATIVE FINANCIAL FUTURES. Our systems around us, such as our fitness watches or computer screens, might soon be able to measure very specific types of emotions. Some of these systems increasingly know how to make correlations with our emotions, for example in how we make financial decisions as people. 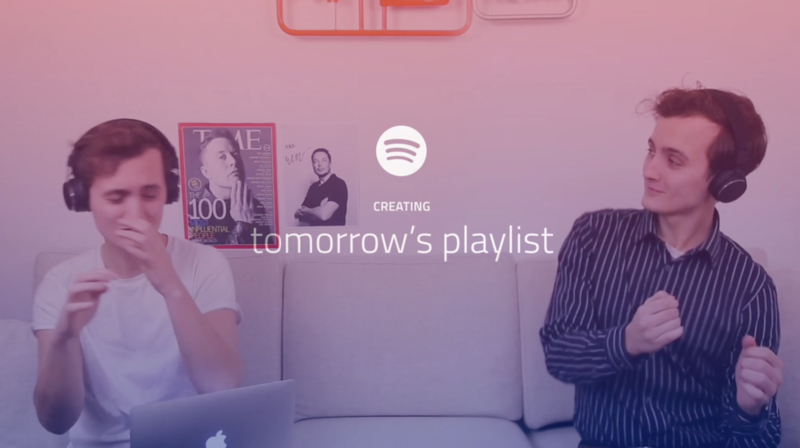 Spotify is one current example. The music service allows users to navigate the platform via mood-based playlists — as opposed to traditional consumption of genres. Through analysing our patterns, it curates the perfect listening experience, according to our mood. Music makes us happy- and what other things does music makes us do? If systems are capable of measuring our sentiment and identifying our intent, what insights can we draw from our emotional state when it comes to our financial decisions? 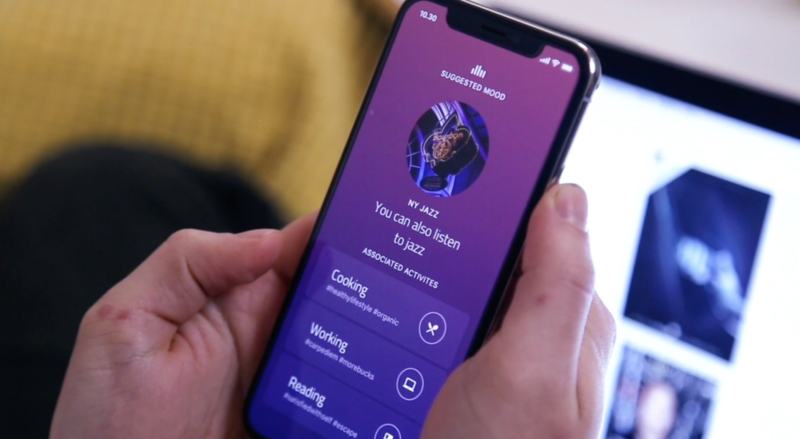 In this near fictional future, we posed the idea of having a system that lives with you that increasingly recognises your mood through the music you listen to, combined with knowing your location and browsing history. Scopus is financial a system that knows your goals and aspirations. Scopus is therefore able to make beneficial data correlations, that are presented to you when you need them in the daily journeys of your life. The project was a speculative project, focusing on “thing” - centered design research and data driven design. The brief given was very open for interpretation, testing our skills as designers to make sense of the new and complex knowledge gained. Weeks of theory and critical knowledge on data economy, mixed with our personal interest in psychology and human behaviour, led us in to a pathway of exploring human emotion linked to peoples financial decisions. “ Purchases reflects our innate human emotions, such as fear, anger, regret, and happiness. We started out with giving randomly selected people a probe. This probe was an excel sheet, which in we asked them to give us insights on some of their recent purchases. The people started to #hashtag their purchases, and graded the VALUE vs MONEY aspect each purchase. These qualitative insights, such as comments and hashtags, gave surprisingly interesting results, since it gave us insight as in how to think as a system and how to start quantifying emotions. “The pattern emerging were that most people are not aware on how much they spend on things that really doesn’t mean anything to them. How could we bring out the real values of peoples purchases and transactions in life? This is the questions we now started asking for this project. Buying a coffee in a cafe, may feel like nothing, but buying that special handmade cup for your loved one in a special store can feel like it means the whole world to you. Still, in your bank-app- these transactions looks exactly the same with - signs. These are very factual representations. We followed up with interviews on how people view their subscription friends. Later we mapped out journeys with our personas, to be able to comprehend the journeys people go through in their daily life and how they make their financial decisions. Most people had epiphanies that their random purchases and values were closely related. This led to interesting discussions about what the system could do to help them improve or achieve their goals. Using sketches, user journeys and a living strategic scenario script, became our tools to tell the story. We worked closely with making narratives and with the use of storytelling as method. This was a choice we took due to the complex nature of the concept - and to be able to show several digital touch-points with data in a clear way. With online calls and advice from Martin Gärdemalm from Lampray production company we got a lot of insight and knowledge in movie-making. We filmed during a few days and edited during half of the week. “Our project revolved around system-to-human interaction, exploring when and how systems touchpoint with people. We played the role of the system, and tried to think as the system - if this data point converge with this one, what can happen? Designing for data and show data generation over time in a digital system, is a very complex process. User / thing perspective is important. We reflected that this perspective needs a lot of knowledge on data driven models and business models. We could have concentrated on just one aspect such as music, which would have made the concept a bit more narrow, but we wanted to see where the process could take us in our speculation - which made the system correspond to data points from goals, mood, persons location etc. -Context is important, which is why the chosen medium of storytelling is very important to make people relate to complexity. It is about bringing systematic probes to people to view reactions, more than generating from the previous user centered design insights (test and iterate). The approach becomes constructivist, to try to improve and change from “within” systems, rather than create entirely new ones, as in for example the approach from design fiction. -Trust is key and very important for the user. It is about sketching out and prototyping how a system like this could be trusted. You benefit from showing data transparency and taking it down to the level of simple, everyday interactions. In our example, we based our whole story on real-life interactions from the people we had interviews with. It made them relate to the complex system in a more comprehensible way. The first part of the project was based on behaviour economics, and we conducted a series of user workshops with probes, that we organised as a team. I later took the lead on the overall strategy and storytelling methods, as well as the organisation of set up, connecting users together, scheduling and movie making. In this project I conducted minor parts of the UX and a larger part of the After Effects animation and editing.